So many new fabrics have arrived in the past week! We thought you'd like a peek at some of our newest arrivals. We're having so much fun with the Be My Neighbor house "blueprints" from MODA! The completed quilt will measure 68 x 84 (we'll provide setting instructions). Below you can see our version of Block 1, 2 and 3. Click here to download Block 3. Remember, every week until Dec. 19, a new "blueprint" will be available in our newsletter and on our website. Even if you don't have time to make them now, download the blueprints while you can-they will only be posted for 2 weeks! Missed Blocks 1 and 2? You can still download the blueprints on our website, but hurry-Block 1 will be removed this weekend. Be the first to bring in a completed Neighborhood quilt and win a prize from Quilt Patch! 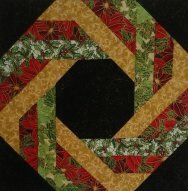 The Sandhills Quilt Guild is holding its annual quilt show, Quilting in the Pines, September 23-24 in Pinehurst, NC. The show features more than 150 quilted items, vendors (we'll be there!) raffles, a silent auction, and a Guild Boutique. For more information go to Sandhills Guild Quilt Show.